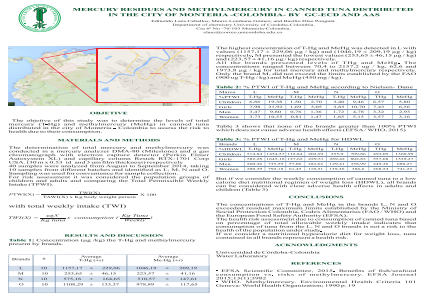 Abstract: Determining total mercury (T-Hg) and Methylmercury (Me-Hg) in canned tuna distributed in the city of Monteria –Colombia. 40 samples were analyzed from August to September 2014, taking 10 samples from different batches and identified as L, M, N and O. Me-Hg was determined by gas chromatography with electron capture detector (Perkin Elmer XL Autsystem) Column Restek RTX-1701 USA corp. (30 m x 0.53 [micro] m ID and 3[micro] m film thickness). The T-Hg was determined with a mercury analyzer DMA-80. The L, N and O marks showed concentrations of T-Hg and Me-Hg, on Maximum Residual Limit established by the Ministry of Social Protection, Colombian. The highest concentration of T-Hg and Me-Hg was detected in L with values (1157.17 ± 229.06 mg / kg) and (1046.19 ± 209.19 mg / kg) respectively. In contrast, M presented the lowest values (253.65 ± 46.15 mg / Kg) and (223.57 ± 41.16 mg / kg) respectively. The evaluation of the health risk from eating canned tuna based on percentage of total allowable weekly intake suggests that tuna consumption of L, N and O marks, can be considered a risk to the health of the population and especially the children are most vulnerable. This study allows to know the risk to which the population is exposed by consuming canned tuna distributed in the city.